ATTLEBORO, Mass. (AP) — Two men authorities say were in a car with former New England Patriots tight end Aaron Hernandez before one of his friends was shot to death were in custody on Friday, one charged with illegally carrying a gun and the other accused of being an accessory after murder. 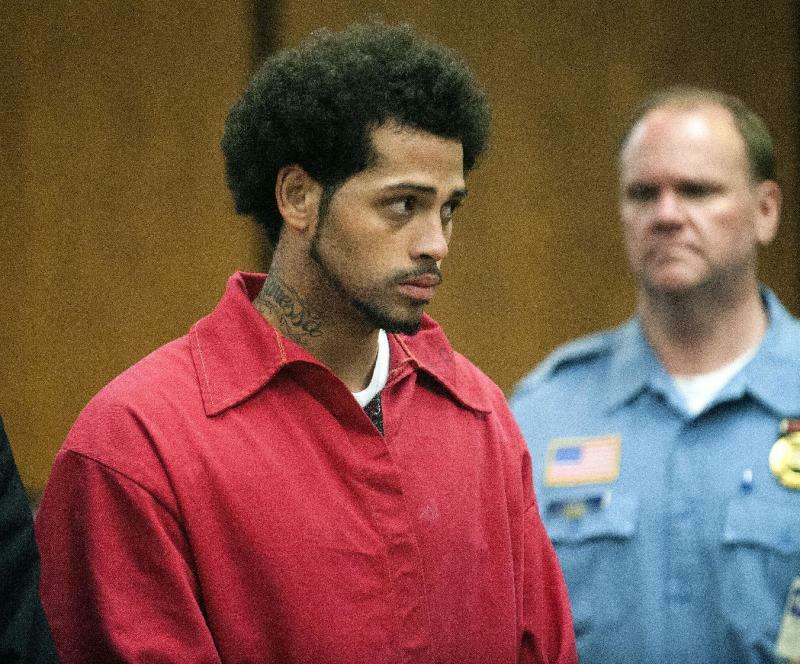 Prosecutors, who this week charged Hernandez with murder, haven't said who fired the shots that killed his friend Odin Lloyd, a Boston semi-pro football player. Carlos Ortiz, who was arrested in Connecticut but was transferred to Massachusetts to face the gun charge, and Ernest Wallace, who walked into a South Florida police station to surrender, were identified earlier as being with Hernandez and Lloyd the night of his shooting death, a prosecutor said. Ortiz was charged Friday with carrying an unlicensed firearm in North Attleborough on June 17, the day Lloyd was found shot to death near Hernandez's home there. Details of the charge weren't released. Hernandez, Ortiz and Wallace were in a Nissan Altima with Lloyd shortly before his death, Bristol County, Mass., District Attorney C. Samuel Sutter said. "We now have in custody the three individuals who were in the silver Nissan Altima," Sutter said Friday when Ortiz was arraigned on the gun charge in Attleboro District Court. All three men have ties to Bristol, Conn.: Hernandez grew up there, Ortiz had been living there and authorities had conflicting addresses for Wallace there and in Miramar. Ortiz's attorney, John Connors, said he will seek bail for his client at the July 9 hearing. He described Ortiz as a "gentle person" and said he will advise Ortiz to plead not guilty. "I can say that his charge has nothing to do with homicide," Connors said. "He stated he knew he had a warrant because he saw himself on TV," Miramar police Officer Gil Bueno said. "He was very cooperative. It was uneventful." An attorney for Wallace, David Meier, told The Boston Globe that his client was visiting his mother and other relatives in Miramar when he realized he was wanted in Massachusetts and went to police. Meier said Wallace intends to return to Massachusetts "as soon as possible." "He's not that type of person. He has a good heart," said friend Milton Montesdeoca, who added he didn't know Hernandez and never heard Ortiz talk about the football star. A few minutes later, he texted Lloyd to tell him he wanted to get together, prosecutors said. Authorities say the three men picked up Lloyd at around 2:30 a.m. June 17, drove him to an industrial park near Hernandez's home and shot him five times. Hernandez, who was drafted by the Patriots in 2010 and signed a five-year contract worth $40 million last summer, could face life in prison if convicted. Collins reported from Bristol, Conn. Associated Press writers Bridget Murphy in Boston and Michael Melia in Hartford, Conn., contributed to this report.